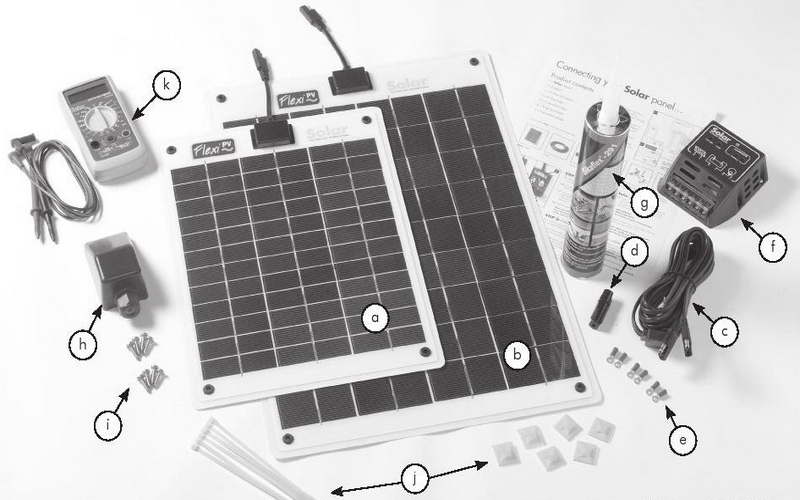 Note – It is recommended that a 4Ah or 8Ah Charge Controller is added to any system (if not included in the kit), if the Flexi PV panel is to be connected to a battery with a capacity smaller than 70Ah. If using the SFP010 panel, or a capacity smaller than 140Ah if using the SFP020 and larger panels. A blocking diode is ﬁtted in the junction box of all panels to prevent reverse battery drain. 1.1 Select a location that is generally free from shade, has a solid surface and is within 4m of the Charge Controller and/or battery. If the Roof Top Kit has been selected please also refer to Step 3.1. 1.2 If the panel is to be free standing, go to Step 2. 1.3 Ensure all panels can be sited close to one another (if a multi panel system has been selected), and that the connecting cable can be correctly positioned. 1.4 If fixing the panel using screws through the panel’s mounting grommets, ensure the fixings penetrate deep enough to ensure the Flexi PV is help securely. 1.5 If fixing using SIKA Flex bonding agent or similar, mark the area with a pencil line where the panel(s) are to be fixed (SIKA Flex is very strong and instantly bonds, so there is only one chance to get the location correct). Clean the area well and ensure any grease or other film is removed. Now apply a thin line (approx 6mm wide) of SIKA bonding agent or other to the outside edge of the underside (not the solar cell side) of each panel. Carefully place the side with the bonding agent within the positioning pencil lines drawn earlier. Firmly press down on the panel so that the bonding agent squeezes near or on the edge of the panel. (it does not matter if the agent squeezes further but it is not as neat). Repeat this process until all panels are fixed. SIKA Flex 291 generally takes 24 hours to cure. Please check the manufacturers recommended curing time if using another agent. 1.6 In some cases it may be desirable to both bond and screw the Flexi PV in position. If this method is selected, ensure the holes are pre drilled before bonding the panel(s) and ensure a liberal blob of bonding agent is applied to each hole, ensuring that once the screws are fixed the hole will be sealed (Note – once the bonding agent is applied to the holes, time is limited before it “sets off”). 2.1 The Flexi PV is supplied with a single extension cable (if a single panel has been selected), or a multi gang extension cable (spider) if a multi panel system has been selected. Join the trailing cable from the solar panel(s) to the extension cable using the plug/socket fitted to the cable. 2.2 If the Roof Top Kit has been selected, this cable can now be secured using the nylon base and cable ties supplied. Once the cable run has been determined, remove the cover from the sticky pad on the underside of the nylon base and fix it to a clean dry surface underneath the cable run – spacing one base every 30cm. Now secure the cable to the base using the cable ties provided. 3.1 The Cable Feed Gland is a completely waterproof unit designed to cover a hole that has been drilled to channel the Flexi PV cable from the outside to inside. The location of the Flexi PV panels (as discussed in 1.1) will have been determined, to a certain extent, by the desired location of the cable feed hole. The cable entry point should allow the cable to be easily routed to the Charge Controller (if used) and the battery. 3.3 Mark the area around where the gland is to be ﬁ xed and squeeze a 6mm line of SIKA Flex on the underside of the gland ensuring there are no gaps. Now ﬁ x the gland onto the dry, clean surface. SIKA Flex will take 24 hours to cure. Ensure this process is completed at roughly the same time as step 1.5. 3.4 Now push the cable from the solar panel(s) through the gland grommet so that it is reasonably taught. The threaded grommet can now be tightened ensuring a perfect seal is made around the cable itself. 4.1 A Charge Controller will be necessary for SFP020 and above and if using the SFP010 on a battery smaller in capacity than 70Ah. 4.2 Position the Charge Controller as close as possible to the battery (must be a dry location). 4.3 Measure the distance between your battery terminals and the Charge Controller. 4.4 Cut the extension cable so that there is sufficient cable to reach the Charge Controller and then to reach the battery. 4.5 Strip back 20mm of the black outer sheath of the cable end to be connected to the Charge Controller. 4.6 Strip back 20mm of the black and red inner sheaths to reveal the bare cable. Twist both ends and connect to the terminals G of the Charge Controller, ensuring the positive and negative polarity is observed (either wrap the cable around each terminal G or crimp 2 ring terminals to the cable end). 5.1 Strip back the black outer insulation of the cable 20cm. 5.2 Cut the red cable at the halfway point and strip 5mm of the red insulation from both the cut ends. Twist the bare wire ends tightly. Fit into the screw terminals on each of the fuse holder pieces. 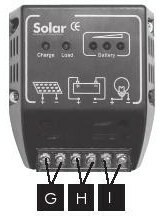 6.1 If the 10 Watt kit has been selected, the crocodile clips can be fixed directly to the terminals of a 12v battery (greater in capacity than 70Ah) ensuring that the correct polarity is observed. 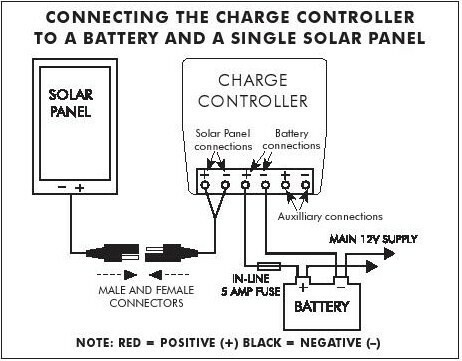 If a smaller battery is to be used, either cut the crocodile clips, purchase a Charge Controller and follow Step 4, or self regulate the Flexi PV. This entails checking the battery at regular intervals with a digital voltmeter and when the battery is showing a volt reading of 14v or above, disconnecting the Flexi PV until the battery level has reduced. 6.2 Alternatively, for a more permanent connection to the battery, strip the red and black insulation (6cm) from the inner cable ends, twist the bare wire, wrap around the battery terminals and ﬁ x into position using your battery clamps. Some clamps have connection screws ﬁ tted, in which case, if the supplied ring terminals have been crimped onto the wire ends, simply attach using the battery clamp screws. 6.3 When connecting to a battery always observe correct polarity. 7.1 If the selected Flexi PV kit has been supplied with a Charge Controller, this product comes with its own instructions and LED indicators will conﬁ rm the system is working correctly. 7.2 If a Roof/Decktop Kit has been selected that includes a Solar Test Meter, the performance of the panel and the Charge Controller can be accurately checked. 8.1 Any Flexi PV panel can be expanded by up to three panels (if a single Flexi PV panel was selected in the ﬁrst instance). In all cases the 8Ah Charge Controller (if originally supplied) will accept up to 4 panels (80W combined). 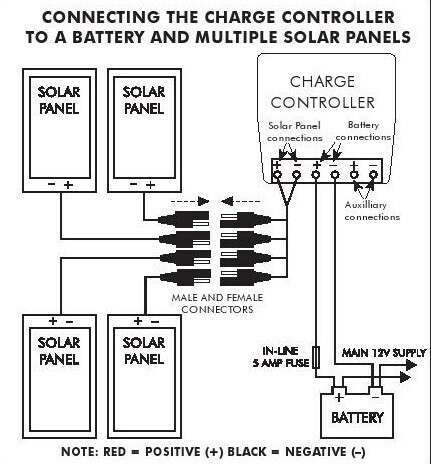 9.1 Should you require your solar system to power 240V appliances, you will need to connect an inverter. Select an inverter power (measured in watts) that is most appropriate for the power of your appliances (also measured in watts). The inverter will be ideally positioned reasonably close to the battery. Most inverters come with pre-ﬁxed cable so ﬁx the loose end directly onto the battery terminals (positive to positive / negative to negative) – contact 01684 774000 for more information. 10.1 If a second battery is used, it can be connected to the Charge Controller, using terminals I, by means of an additional piece of 2-core, 1mm cable (not supplied). As in step 4.6 above, attach the other cable to the second battery, not forgetting to add a fuse on the positive line as descibed in step 5 above.Power from the Charge Controller will be diverted to the second battery only when the primary battery is fully charged.